1. Choose the video file you want to clip. Then click "Edit Effect" icon , and in the popup box, the video will be played automatically. 2. When the video is playing, click "Start" icon to clip the video based on time by blue marker. Note: When the video is paused, it doesn’t support clip. 3. And then click the available "End" icon to complete the clip. 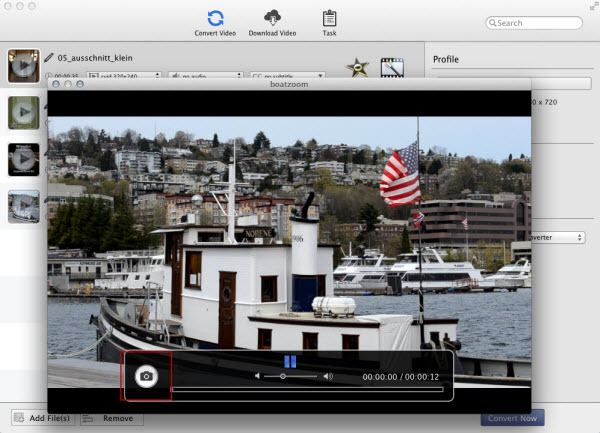 (1) When click "Clear" icon , the blue marked clip will be deleted from playback progress bar. (2) You can restart clip the video by click "Start" icon when a clip completed. And the prior one will be removed. 1. Add all the files you want to merge to the program. 2. Click the required profile in “Profile” drop list on the main interface. 3. Check on "Merge all video" and click "Convert Now!" button, you can merge multiple files into one. 1. One file does not support to merge. 2. 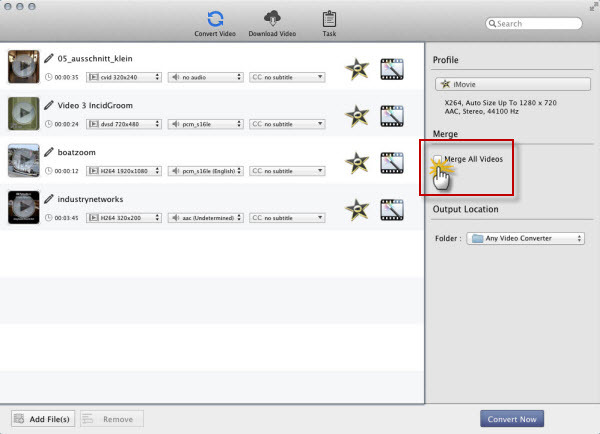 The videos of merge video can freely add, delete, sort and preview. 3. The videos of merge video can’t custom profile separately. 4. The merge video doesn’t support edit video. 1. After adding the file, click "Edit Effect" icon , and in the popup box, please shift to "Crop" tab. 2. Check on "Enable Crop" and then the crop frame will show up in the "Original Preview" window. The Output Preview will display the pictures from viewfinder. 3. When Checking on "Enable Crop", click the drop-list to set the "Zoom Type" such as Letter Box, Keep Original, Force Scale, 16:9 and 4:3. 4. How to Flip or Mirror Video? 1. Choose the video file you want to flip or mirror. Click "Edit Effect" icon , and in the popup box, please shift to "Crop" tab. 2. Under Crop tab, you can check on "Flip" or "Mirror" to flip or mirror video. The Output Preview will display the pictures from viewfinder. 5. How to Apply Special Effects? 1. After adding the file, click "Edit Effect" icon , and in the popup box, please shift to "Effect" tab. 2. 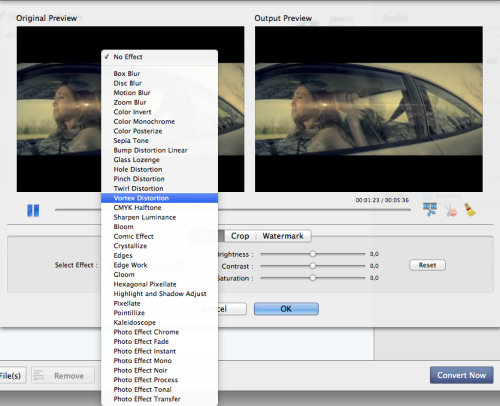 Under the tab, "Select effect" drop-list to set No Effect or add the effect such as Blur on the video. 3. 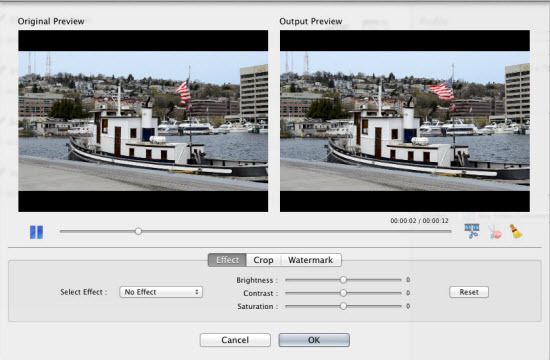 Drag the value sliders to adjust Brightness, Contrast and Saturation. Tips: You can click "Reset" button to cancel the Effect settings on the video. 6. How to Add Watermark on Video? 1. Choose the file you want to add watermark, click "Edit Effect" icon , and in the popup box, please shift to "Watermark" tab. 2. Under the tab, Click Watermark Type drop-list to set No Watermark or set watermark with Image Watermark or Text Watermark. 3. Set Image Watermark: Click the available … button to add Watermark Content and then drag the available slides to adjust Opacity. 4.Set Text Watermark: Input the text in the Watermark Content and click the available … button to set the font. Then drag the available slides to adjust Opacity. 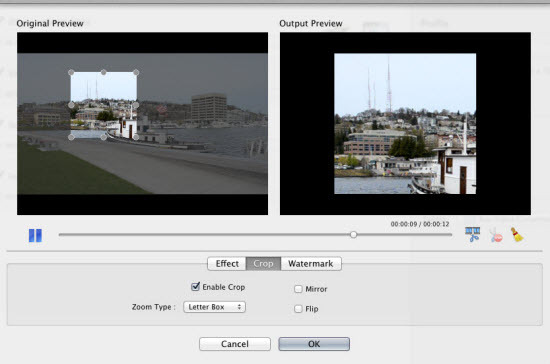 (1) You can drag and resize the watermark in the Output Preview window. (2) Changing the Watermark Type will remove the watermark that has been added. 7. How to Save A Frame? 1. Click the play button at artwork of each file to let you preview the video. Then a preview window pops up. Tips: At the bottom of the window, a menu bar with play button, sound button, screenshot button, progress bar and time parameters can help you preview video better. 2. Click the screenshot button on the menu bar, then a frame from the video will be saved to the default path "/ Users/ user/ Pictures/ Any Video Converter" with ".png" format. 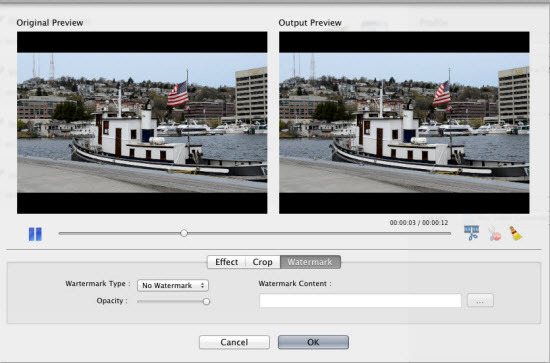 (1) All effects produced from Effect, Crop and Watermark will be both displayed in the Output Preview window. 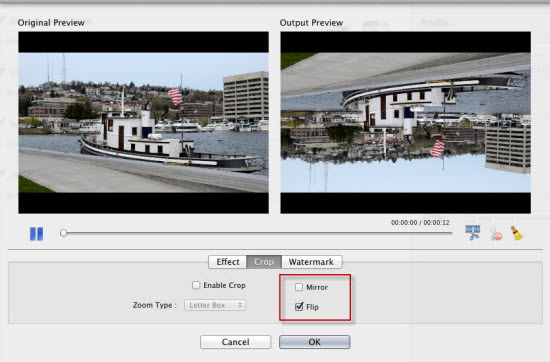 (2) Changing the Clip, Effect, Crop and Watermark is independent with each other.